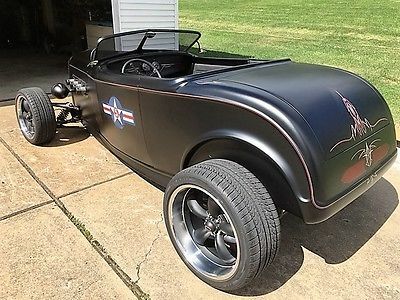 This is a 1 of a kind 32 Ford Roadster. This is NOT a RatRod! Alloway frame with pinched front end powder coated matte black. Heidts stainless open wheel frontend all parts powder coated matte black. Rack and Pinion Steering. Currie aluminum 9 inch rear end powder coated matte black. Aluminum coil over shocks front and rear with powder coated springs. Wilwood disc brakes on all 4 wheels. All brake line stainless. Coys aluminum wheels powder coated, 17 inch front, 20 inch rear. Crate 350 Chevy from GM with new TCI turbo 350 transmission with Lokar shifter. 3.50 rear end gears. 3x2 Rochester carbs remanufactured from Summit on Elderbrock intake with electric choke. Everything on the engine is painted or powder coated. Custom made air cleaner. Awesome exhaust that exits through the hood sides with Harley Davidson baffels in each side. Fuel line is stainless braided hose ran through the frame with all black AN fittings. Walker radiator with Cooling Components electric fan. Body is Rats Glass with Duval windshield. Body painted with SEM Hot Rod Black urethane enamel paint. Hood top is 4 piece steel with 3 piece steel hood sides. The hood tops open with electric actuators. Grill insert is stainless powder coated black. Trunk operates with electric actuator. Aluminum bomber bench seat hand made with over 1000 hand bucked rivets and powder coated black. Custom made center console. Ultra leather upholstery by Portage Trim. New Vintage dual quad gauges with GPS speedo sensor. Pushbutton start. Hidden battery disconnect actuator. Custom flush mounted LED tail lights. Fuse panel, relays and Optima battery all in the trunk. All wiring is hidden. Molded in hidden motorcycle gas filler. Car is titled as a 1932. Car has been done for about 4 years. Competed in Goodguys Hot Rod of the Year Competition. I also have a 1973 Yamaha XS650 bobber custom hardtail that matches the car. This car is very unique, please call with any questions. 304-748-5801 or 304-559-1721. 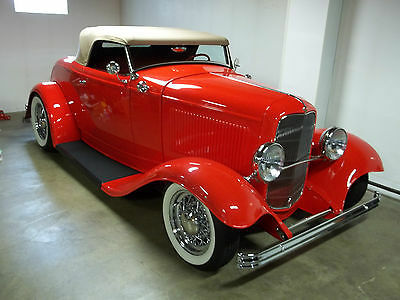 1932 Dearborn Deuce convertible with only 1800 miles since completed in 2010. The Dearborn Deuce convertible is an all-steel roadster body redesigned around an amazing, fully disappearing top assembly. Several body design changes were necessary in order to package this top mechanism in a 32 roadster but also preserving the original look of the standard vintage '32 roadster body. Look closely and you will see the doors have been stretched 3" rearward to meet the new top. They are also reshaped at their front edge to bring the side glass forward. The cowl was reworked to accept a specially designed windshield that meets the side glass. The new side glass is curved and it has been tooled exclusively for this car. An opening "tulip panel" behind the seats stores the entire top assembly completely out of sight. The cockpit was deepened by stealing 2 1/2" from the tulip panel allowing you to sit back further in the cockpit and have more legroom. The outer dimensions of the body, and even the stock trunk lid , have remained bone stock. The hood (Rootlieb), fenders(Brookville) and running boards (Bob Drake) are all steel as well. The chassis also comes from Dearborn Deuce with complete chrome 4" Super Bell axle, Wilwood front disk brakes, Unisteer rack and pinion steering and 9" Ford rear end with drum brakes and coil over suspension. The drivetrain was built using a brand new GM 350 crate engine with edelbrock aluminum intake and three Stromberg 97 carbs that have been completely rebuilt. A brand new 700R automatic overdrive was utilized as well. This car also features power windows, Dakota digital dash, Vintage heat and air conditioning, remote doors, AM/FM/CD radio (mounted behind the seat with remote control sitting on the center of the front floor at your fingertips) and a Haartz cloth convertible top with glass rear window. The Viper Red paint is excellent with no dings, dents or scratches. The body and alignment are laser straight and all chrome shines brightly. The custom interior looks beautiful in the car which uses 60 Chevy inserts in the seat, door panels and trunk. It looks even better in person. Inspections are welcomed and encouraged. If you see this car, you will want it. All reasonable offers will be considered. Car was professionally built using quality components, however as most used cars on Ebay, it is being sold as is, with no warranty whatsoever.